Visitors in St. Michael’s School classrooms last Sunday. 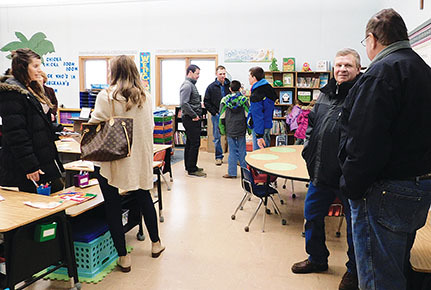 Many parents and grandparents of St. Michael’s School students visited classrooms during the opening day of Catholic Schools Week last Sunday, Jan. 28. Special events are being held throughout this week by students and staff. A book fair has been underway in the church basement throughout the week. Today, Wednesday, Jan. 31 — Dress Up day and classroom visits for business partners. Thursday, Feb. 1 — Comfy Day and board games for students. Friday, Feb. 2 — Jeans and Class Colors Day. Family sack lunch will be held at noon.